Gillette Generators Gen-Pro GPE-55H 5.5 kW gasoline portable generator. Includes Honda engine with automatic oil sensor. Exclusive Kleen-Power technology ensures quality power for running computers and other sensitive electronics. Gillette Generators Gen-Pro GPE-55EH 5.5 kW gasoline portable generator. Includes Honda engine with automatic oil sensor and electric start. Exclusive Kleen-Power technology ensures quality power for running computers and other sensitive electronics. Gillette Gen-Pro GPE-75EH 7.5kW gasoline portable generator. Includes a 13hp overhead valve Honda engine with automatic oil sensor. Uses exclusive Kleen-Power technology for running computers and other sensitive electronics. Gillette Gen-Pro GPE-95EV gasoline portable generator. Includes a 16hp overhead valve Vanguard / Briggs engine with automatic oil sensor. Uses exclusive Kleen-Power technology for running computers and other sensitive electronics. 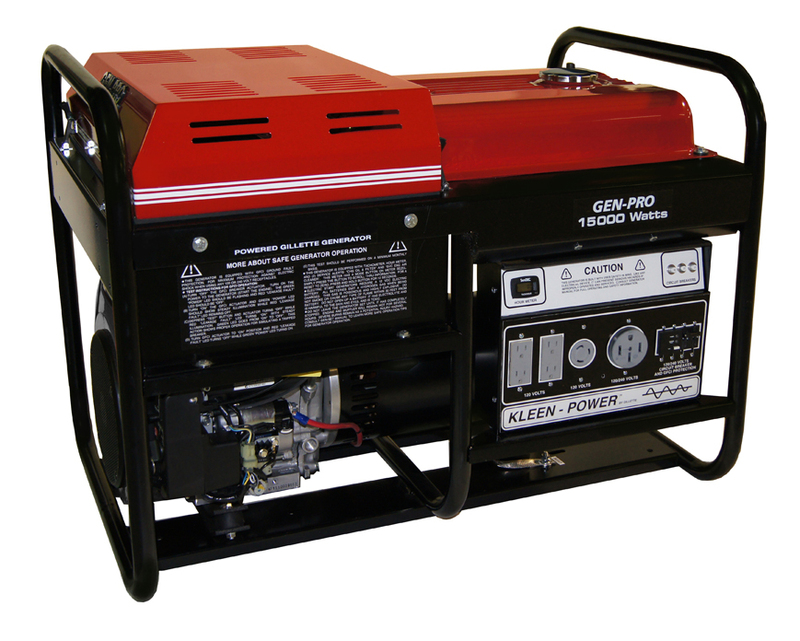 Gillette Gen-Pro GPE-125EH gasoline portable generator. Includes a 22hp overhead valve Honda engine with automatic oil sensor. Uses exclusive Kleen-Power technology for running computers and other sensitive electronics.